Dolby enters wireless headphones market with Dolby Dimension | What Hi-Fi? The crowded headphone market didn’t need another brand, but it has one any way. And actually, we’re quite glad to hear who it is. 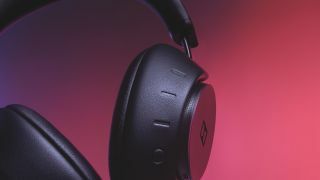 Dolby, who has been a pioneer in audio and video formats for decades, has introduced its first pair of headphones, the very fittingly-named Dolby Dimension. And Dolby has produced a proprietary new technology called Dolby LifeMix especially for them. ‘Central to the Dolby Dimension experience’, according to Dolby, it allows users to control how much they hear of their surroundings - ranging from ‘transparency’ to ‘active noise cancellation’. Dolby wants you to use the headphones to control what you hear rather than fiddle with source volumes and modes. That’s controllable via the on-earcup controls or Dolby Dimension app (iOS and Android, free). The latter of which also facilitates paired device management and head tracking adjustment. The company clearly envisions scenarios whereby the headphones would be connected to multiple devices. Users can tap one of three source buttons on the right earcup to instantly change source devices, whether it’s a Bluetooth-enabled TV, computer, tablet, or phone. So far so good - and considering Dolby’s experience, we’d hope the sound quality from their custom-designed 40mm drivers wouldn’t let them down. Especially considering their not-insignificant price. The Dolby Dimensions are available from December 1st in the US, priced $599, however there’s no word on when they’ll hit UK shores yet.